As a society, we are constantly discouraged from the concept of never. My trip to Walt Disney World was beautiful and bittersweet. And it was harder than I thought. I had been there with BvP so many times. We had experienced every attraction and every show. We knew where the fun parts were and where all the quiet nooks were. And I will never be there with him again. When you attend a funeral of a loved one, it’s easier to believe the never. And if you have a strong belief in a spiritual afterlife, you can even alleviate that instance of never because you know you’ll be reunited with your loved one someday. But it’s damn hard to associate never with someone who is hale and healthy and lives only a few miles away. There were places in WDW where I literally had to stop walking…the pain was too crippling. I will never break a pretzel bread in half with him again at Le Cellier. 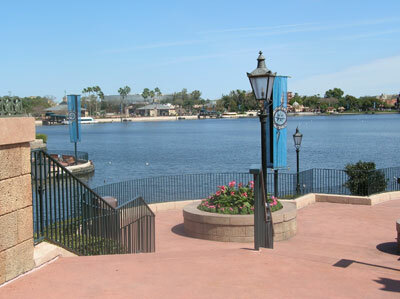 The girl crying outside Epcot’s Canada on Saturday? That was me. We will never watch the lights sparkle in the trees as we share an evening soda at Downtown Disney again. The girl crying at Wolfgang Puck Express on Sunday night? Me. Those were the things I managed to do. There were many things I couldn’t do. I couldn’t look at the collectible pin carts. I couldn’t listen to the monorail spiel about ‘Ohana at the Polynesian. I couldn’t enter Tomorrowland or Adventureland. Memories that were pleasant when shared have become painful alone. I’m lucky Mom was with me. I did a lot of talking and she did a lot of listening. I had a fantastic time, but in many ways, this trip was a funeral for a 11-year-long relationship that died far before its time. I can accept that fact that we are over. It’s the wrapping the brain around the nevers that’s proving difficult. I usually close comments on these posts, because I don’t want you to think I’m fishing for “you go girl!” compliments. This time I’m leaving them open because I truly want to know how you’ve dealt with never in your lives. If you’ve been lurking and never commented before, I welcome you to do so. For me, that kind of “never” is such a big word, so full of memories and perhaps so full of hopelessness… a period in the page. But, after all, I found that a full stop is an opportunity to start a new brand sentence, to bring the best of your past into the present to recreate it with new words, and move forward. What if my dad had never died when I was 7? What would my life be like? What would HE be like? As much as I would like to know, I can’t. That’s not the hand I was dealt. The reality of the situation is that he’s gone and is never coming back. As such, I can’t dwell on things that might have been. Here and now is what we have; you can’t change what’s happened. So chin up. It will be hard to move on but it’s necessary. As humans, that’s all we can do. When you and I met 10 years ago at work, I was in the early stages of “never”. With 2 little ones, it was all I could do to just put one foot in front of the other(and eat many pints of Haagen Dazs). I didn’t realize how numb I had been until a year later, when things were gradually getting easier, that someone said, Yay, Jen is back. It’s 10 years later, my kids still haven’t seen their dad, but I just remarried, he is wondeful to me and to my kids, now 14 and 12. I think it’s good that you went to WDW, each time it will get easier. I had to think a bit about what I wanted to write. I’ve been through a few different types of ‘nevers’. Like Dave up above, I have the ‘nevers’ of not growing up with my dad because he died when I was a kid. We had the miscarriage and you think of those ‘nevers’. But I don’t have the nevers that you’re going through right now. I’ve painfully lost boyfriends, even the one I first fell in love with. And I painfully lost a best friend who suddenly ended the friendship. For a long time, I’d see something and my first thought was sharing that thing with them, then I’d remember that I couldn’t. So on top of all the other feelings going on was -loss- and then anger because they took away something so important. So I was missing them and on top of it, resenting that they weren’t there. So it might give me an inkling of what you’re feeling. I can imagine having a trip like you just went through (how could I eat at Trails End Buffeteria again w/o John?). I just wish I had an answer for how to get through it better. But I don’t. It’s just living through it until, like Jen said above, it gets a little easier after awhile. Don’t push doing something too painful right away. Wait until it’s less painful and then do it with someone so you have more good memories of it. You won’t forget the other ones and why should you? It was a good part of your life and should be remembered. But the loss can’t stop you from enjoying it again; the loss just means it will take some time before you can. It’s not so much a “never again” of that sort, more of a never could be, but my dad and Marilyn will never know each other. With that, and a lot of other “nevers” involving my dad, I think I’ve taken a position that, depending on how charitable one is feeling, could be described as either “heartless” or “philosophical.” I’ve sort of accepted the immutability of the situation, shrugged my metaphorical shoulders, and resolved not to dwell on it. I’ve gotten good at ignoring such thoughts on the occasions they crop up unbidden. This is, perhaps, neither terribly helpful information for you, nor terribly healthy behavior for me. But there it is. You may “never” be with BvP again. But, you can smile again, and laugh, and love. You “never” have to stop living. The best thing for you was to go back to WDW. It’s healthy! And Mickey will always be there!!!! I think everyone gave a lot of good thoughts above. Johnnyblack is right – you need to go back to WDW. From reading “Ladygypsy.net” – there is no doubt in my mind that you are a die-hard Disney fan. While personally I don’t like Disney’s practices, it’s hard to get Huey, Duey, and Louie out of your blood. The fact that you did experience pain in WDW is absolutely normal. If you love Disney, you will go back. It will be easier the next time. The fact that you went now is good – it’s kind of like taking medicine. It’s yucky and tastes terrible, but it slowly is going to work on you. You will get better. You will feel stronger. I speak from experience! I think you once posted something under Mary Tyler Moore’s song “You’re gonna make it after all”. I’m not one for TV song jingles, but that song (Sung by Sunny Curtis) is powerful stuff. If you listen to the words, it really sums it up best. Hey, I guess I just gave you a “Today’s Song” on LGN – smile. I’m going down the same road you’ve been down. I was married for about seven years and me and the ex are selling our house. The first Thanksgiving and Christmas apart was in 2005 and I felt awful. But I was fine Christmas 2006. I got used to it and adapted quickly. But I’ll never see her in the same context again, as my wife. They’ll be no more special holidays, no more sharing loving or idiotic moments. No more togetherness. For me, even though my marriage was unhappy for both of us during the last few years, I wouldn’t trade anything for it. I don’t want to brood over what I’ve lost. I only look forward to a future of limitless possibilities. Take care and have a great life. You deserve it.